Location: Behind the larger Church of Saint Paul, opposite the Police station. 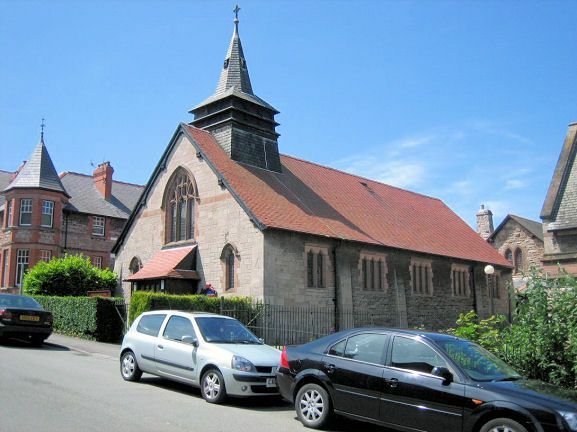 Built as the Welsh Church in a 1902-3, by Douglas and Fordham, architects, of Chester. Squared random limestone rubble with red sandstone dressings, and red plain tiled roof. A low building comprising nave with apsidal chancel at the west end. Perpendicaular style. Entrance in E facing gable in lean-to timber framed porch, with 3-light traceried window above. The main body of the church is articulated as 4 unequally sized bays by raking buttresses, with flat headed windows of 2 and 3 lights. A slate hung bell turret surmounts the roof at the east end, square in plan, raking up to an angled spirelet. Single space divided into 5 bays by hammerbeam trusses, with simple chamfered wood arch and wrought iron scrolled rails made by a local blacksmith, David Jones, to apsidal sanctuary. Part of the an important group with the Church of Saint Paul, the Church Hall, and also with the Police Station opposite.